El 20 de Junio, el concejal de Derechos Humanos del Ayuntamiento de Madrid, Mauricio Valiente, ha enviado una carta a AEGAL pidiendo la desvinculación de la Gala de clausura del World Pride 2017 y el estado de Israel. En esta carta, la concejalía de Derechos Humanos alerta que de llevarse a cabo la colaboración de la embajada israelí en la gala en recuerdo del World pride celebrado en Jerusalén, se produciría una vulneración del derecho internacional de los Derechos Humanos. Expresa su arlama ante la posibilidad de que ésta se produzca en un espacio público del Municipio de Madrid. 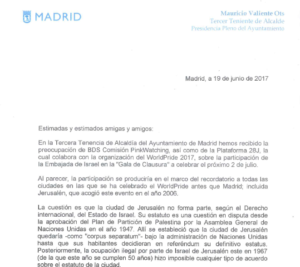 In the office of the Third Deputy Mayor of Madrid we have received the concern of BDS PinkWatching Commission, as well as of Platform 28J, which collaborates with the organization of the World Pride 2017, about the participation of the embassy of Israel at the “Closing Gala” to be held next July 2. It would appear that such participation would take place within the framework of a reminder of all the cities where World Pride has been held before Madrid; including Jerusalem, which hosted this event in 2006. The point is that the city of Jerusalem does not belong, according to international law, to the State of Israel. Its status is a disputed issue since the adoption of the Partition Plan of Palestine by the General Assembly of the United Nations in 1947. There it was established that the city of Jerusalem would be – as “corpus separatum” – under the administration of the United Nations until its inhabitants would decide through referendum its definitive status. Subsequently, Israel’s illegal occupation of Jerusalem in 1967 (of which this year marks the 50th anniversary) made any kind of agreement impossible. Since that year, Israel has tried to annex the city as the capital of its State. But all the measures taken in this regard (such as the basic capital law of 1980) have been declared contrary to international law by the United Nations. According to its General Assembly, all acts and measures that are carried out to alter the status of the city are void and must be revoked immediately. The United Nations also warns that other actors can not take actions that recognize, directly or indirectly, this situation contrary to international law. In addition, proof that Jerusalem is not internationally considered the capital of the State of Israel is the fact that the embassies of all countries belonging to the United Nations (including Spain of course) are not in Jerusalem, but in Tel Aviv. In conclusion, the problematic of the “Closing Gala” is not the reminder to the city of Jerusalem as organizer of an earlier World Pride, but the link between this city and the State of Israel. If the participation of the Embassy of this State in the Gala or the presence in the event of any physical signs that make that relationship palpable (for example, the flag of Israel) is carried out, there would be a violation of international human rights law, condemnable by the competent international organizations. All this makes that from this Deputy Mayor’s Office we are extremely alarmed, as such violation of international law would occur in a public space of the city of Madrid and an event in which this City Council participates. Therefore, we urge that appropriate measures be taken to prevent this linkage between the city of Jerusalem and the State of Israel in the “Closing Gala” of the World Pride 2017, thus contributing to the overall success of the event.